Come cheer us on. This is our third match with our pals, GVG. Training has been intense. Tensions are high. The competition will be fiercely fun. Musician Ed Ivey opened this hip beer and wine lounge in 2010 so it is fairly new and quickly gaining a very good rep. Check out the positive Yelp reviews to give you an idea of how cool 50 Mason Social House is. Ed and I played together years ago in Polkacide. In fact when I auditioned for that band it was at a place that Ed shared with trumpeter, John Lieb. 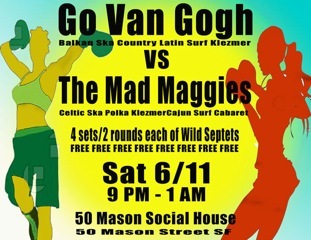 beer, dancing, Go Van Gogh, live music, San Francisco, the mad maggies, wine.